Our large shaker, for no-spill, lump-free shakes throughout the day. With unique screw-on storage, from protein powders to BCAA blends — stay on top of your nutrition, wherever you are. Does the job well. The seperate compartments are good for transporting tablets and powder about if you use more than one. Looks really good. Doesnt leak. Mixes everything up well. One downside, as its black its a little hard to read off the measuremnts (if you bother) i tend to guage it from the inside, where you can see the white MY PROTEIN logo and thats a good enough guide. I'd recommend it though. A tuxedo. Long strolls by the beach. I can't believe I'm sat here writing a review for a shaker bottle but, as the title of this review reveals, this is by far the best shaker bottle I've yet had (I've had a lot) If like me you're sick to death of leaking bottles, that despite your best efforts never seem fully closed or sealed, then this is ideal - no leaks or spillages, mixes well, compact, multi-compartmental and a good size - genuinely on of my best gym related buys yet! Excellent shaker. I work and don’t have time to go home before the gym and I take pre and post shakes. The attachment in the bottom let’s me carry both easily, reducing the size of my bag. Also has another smaller section for my vitamins. Top quality no leaks or spils. 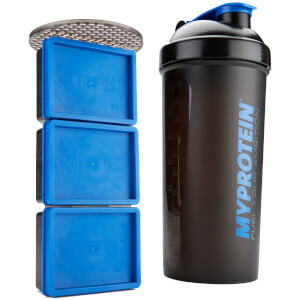 Having the extra compartments is ideal, being able to easily carry everything I need from my multivitamins, protein shake & fish oil tablets is great. 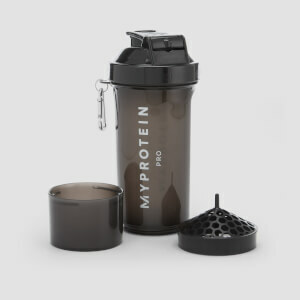 Good quality shaker, great as a water bottle throughout gym sessions and the mesh like grid underneath the lid is great for mixing my shakes. Saves having to use the metal ball! Would recommend! 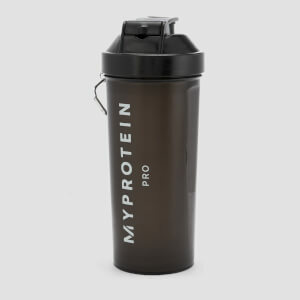 Great handy protein shaker, good quality and very handy having two compartments to store protein powder. Great for quick protein boost straight after gym.